We have a couple of hyper-active designers who keep on cranking out new ideas every day. Every once in a while, we make up samples of their designs and decide which new models to produce for the coming year. We already have over 340 models so we can only make a handful of new ones, which means we have approximately bifty kajillion one of a kind straps around here. So we’re gonna let you have them. There are plain straps, carved straps, tooled straps, Italian leather guitar straps, woven straps and whatever else we’ve come up with lately. We hope you can find something unique that you’ll like. Here’s the deal: I’m not kidding, there’s exactly one of each of these. If you like one, you should buy it because there aren’t any more of them. None. Nowhere. Nada. Last chance saloon! 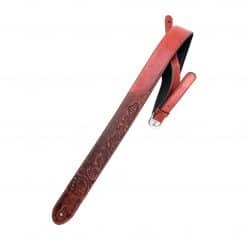 There are a lot of these guitar straps to plow through so we’re going to have to be a little skimpy on details, but you can assume that all the one-of-a-kind straps will be our standard length, adjustable from about 44″-56″ long and approximately 2 1/2″to 3″ wide. We’ll just keep putting them up on the one-of-a-kind page until we’ve got a little more room around here for more of their wacky ideas.